Front brake rotors too thin? 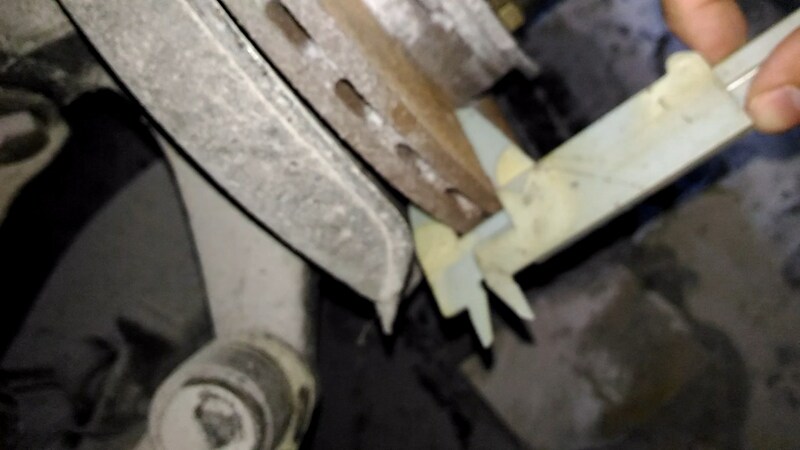 Post subject: Front brake rotors too thin? 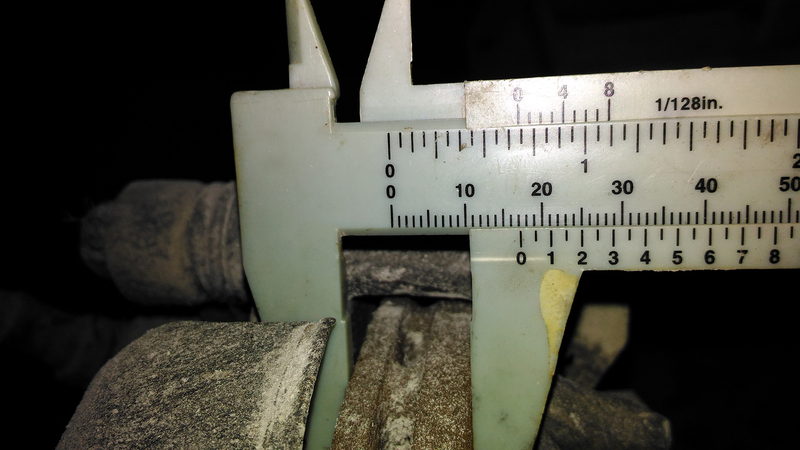 Here's the measurement of the front brake rotors on my 1991 Mitsubishi Lancer GTI Sedan, C62A Body. Post subject: Re: Front brake rotors too thin? Rust is not cause for resurface in that short of time. Welp... Forgot to upload the photo! Hold on. Back is 1/2 as thick as the front, you will continue to have issues. I would get new rotors and make sure the calipers are good. You're right! Haven't noticed that before.. Here are some alternate angles.. Sand down both sides with a 180 grit or similar sandpaper (you can use smoother grits but it may take longer if rust is really set in or pits are somewhat deeper than ideal). It will be tough to sand the inner surface. If lateral runout is excessive, they must be cut but to remove them, it is more cost effective to replace and upgrade! If lateral runout is fine (probably best measured after sanding and or a break in run), then you can keep them. Without having my fingers and eyeballs on the rotors before and after sanding, I can only say that you may be able to save then. Be sure to sand the pads smooth with a fine grit sand paper, as this will remove the previous buildups from sitting and give you new material to bed to the rotors with. If both pads and rotors clean up well, you can take the car out and bed the pads to the rotors. Essentially bringing the pads and rotors up to temperature slowly, with braking stops from say 60-15kmh, and a half kilometer in between each stop, do this maybe 10 times. Then bring the speed range up to 80/100-30kmh and repeat with maybe a kilometer in between stops. If you experience brake fade, let the brakes cool off. Stopping and sitting with the brakes on while bedding/burnishing the pads/rotors - this process transfers material between both parts and stopping could allow uneven transfer to certain areas. 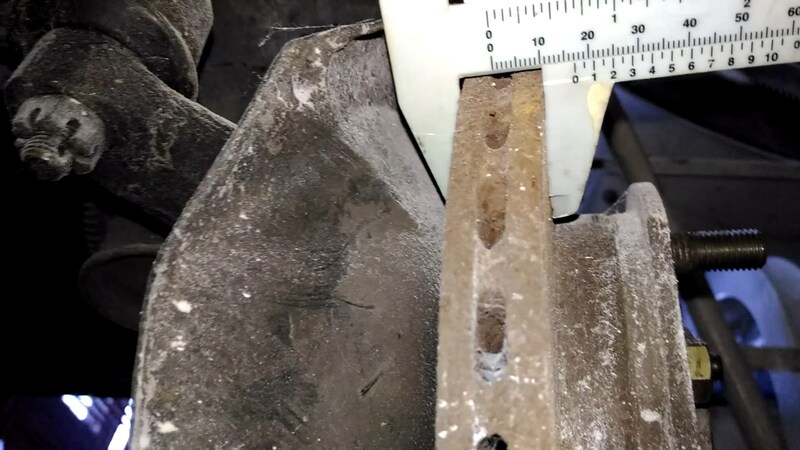 As for the rotors having uneven thickness, I see this a whole lot. 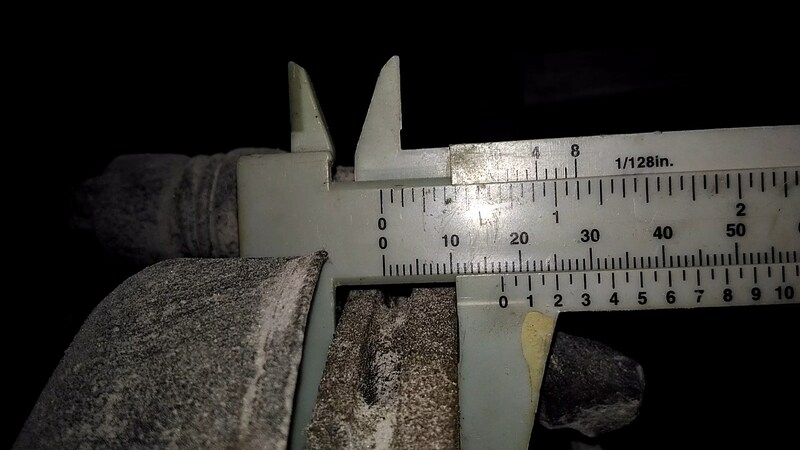 If you have really, really cheap rotor material, this could be a major factor contributing to uneven heat dissipation which leads to warping and or surface thickness variation. I have rotors that are vey similar to your with regard to visually being thicker one half over the other, and lots are like that; you may never have issues, or you might. We know it can be of concern in the long run or at the race track where engineering and proper follow through ring paramount. Clean up the parts and break them in, and see what happens. Worst case the rotor surface never gets fully "smooth looking", and retains pits too deep to wear smooth or you experience pulsation that while initial to bedding the pads can be normal as high and lows in the rotor become more evened out, only time wil tell how your rotors spec and how they will continue to operate. If you are changing the front rotors and or putting on larger heavier wheels, please do the brake upgrade front to back, complete with outboard rotor conversion/two pistons caliper up front, caliper conversion out back, and a new master cylinder to match the front rotors/two piston calipers being installed. Your sedan already has rear rotors? If so, major bonus. I see body cladding, so you must have discs out back to match the larger vented front rotors that came stock with your car. How about the actual thickness or the rotors? Are they worth fixing up today and replacing later on? Where can I find the specifications for the Evolution 1, 2 and 3 Front and Rear brakes? 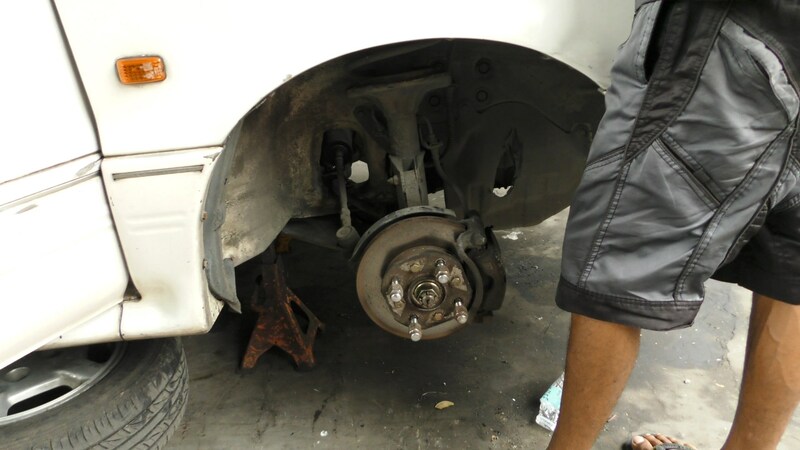 I want to make sure those brakes that I'm looking at are also due for a replacement. Guy selling has all four corner and the Hydrovac. My Sedan is the 1991 Lancer GTI which was the highest trim model available at the time. It came with the 4G15 and drum brakes at the rear, full body kit and spoiler though! The factory service manual will have the minimum rotor discard thickness, an if you are lucky, a value for original thickness too. 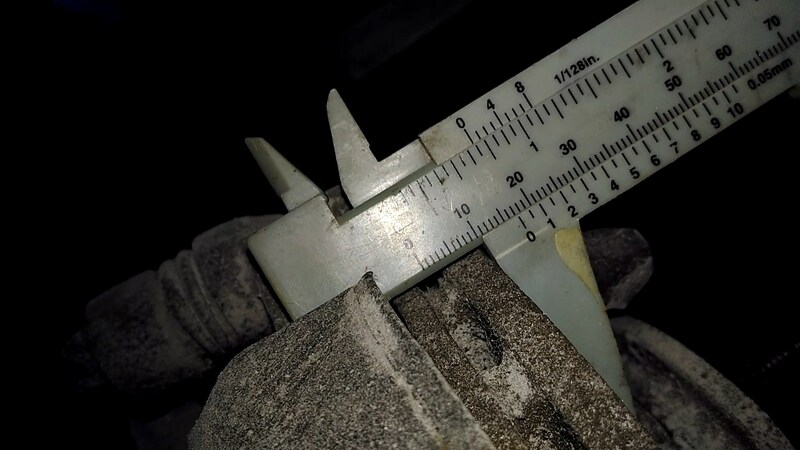 If your rotors are not warped/excessive lateral runout, then machining with an on car lathe could be possible, but any and all work beyond sanding them/buffing them with a tool, can't be advised until you know what your starting point is for rotor thickness. Most rotors have a flat surface from the outside edge right up to the hat that meets the back of the hub IF the only groove evident near the hub is because of pad wear, you are likely okay. 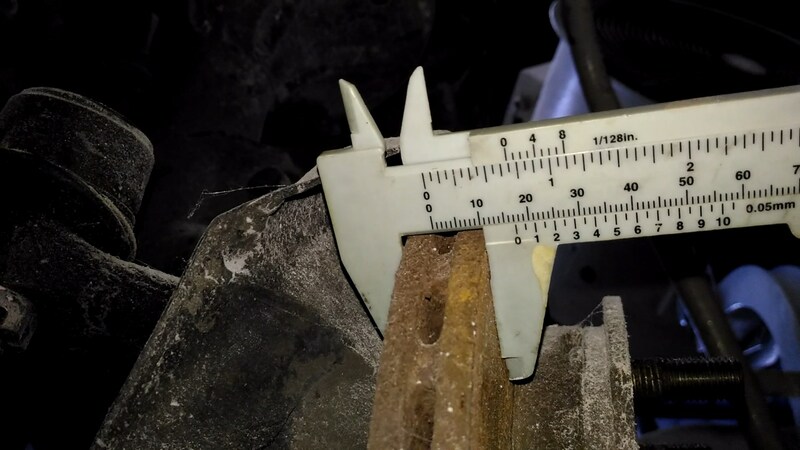 Also, a caliper with greater refinement of measurement is usually put to use when measuring rotors, basically accurate to .001 of an inch. I cannot find the FSM for the Evolution 1, 2, or 3! The oldest I got is the IV and V. I checked lilevo's listing and Google. Ah, I was referring to the FSM for a sedan, to check ventilated front rotors for specs. I'm not sure I have an Evo3-4 manual or not, in PDF form. There must be one listed at the big Evo sites on the Internet. I have forgotten some of the names, but I think one was Evoforums or Evolution.net. You will know by the breadth of the posters knowledge, if you have landed in the correct place.